We were approached by a West Midlands based family whom had an old up and over door that had become heavier and heavier to operate. Also the seals down the side had been deteriorating over the years to the point where sun light could now be seen around the entire door perimeter. Unfortunately a simple door replacement was not easily achievable as there was also an issue with the door aperture. Internally a soil pipe was restricting the opening therefore making it difficult to install a new garage door. After one survey Worcester Doors came up with a solid pressed steel frame that was powder coated to match the new insulated remote control garage door all finished in a matching gloss white. Not only did the frame provide sufficient clearance to allow the new door to be installed it also acted as both a door support frame and an aperture frame to provide a clean and aesthetically pleasing appearance. 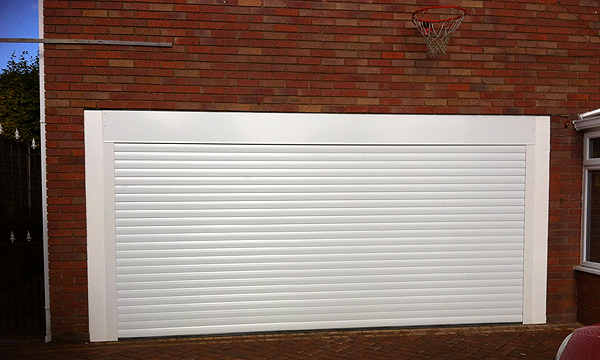 The client was very very pleased with the new insulated remote control garage door, happy that it was secure and safe because of its integral safety brake anti-fall system and safety beam with automatic return facility and also instantly noticed the heat increase within the garage and the adjoining parts of their home.